Our own Solar System has a similar ring to that of Formalhaut called the Kuiper Belt, but it is estimated to have a thousand times less material than Fomalhaut's ring. 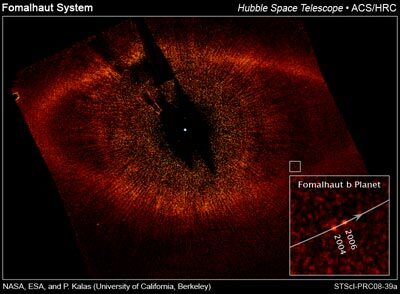 Fomalhaut is believed to be a young star, only 100 to 300 million years old, with a potential lifespan of only a billion years. The surface temperature is around 8,751K. It's mass is 2.1 times that of the Sun luminosity is 18times greater and its diameter is roughly 1.8 times as large. Its habitable zone is far farther out than that for our Solar System. This is however rather theoretical since the star is only destined to 'live' about a billion years.